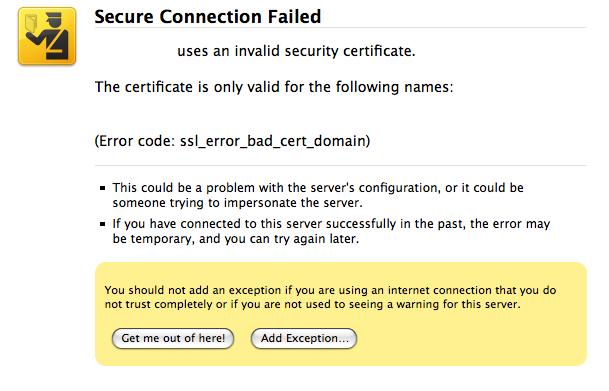 I’ve just upgraded to Firefox 3 – and I’m really glad to see that the developers have made the ceremony around suspicious certificates both more informative, and much more strongly worded. I love to see this kind of progress. Server names deleted to protect the innocent. I have an SSL certificate for my domain. And it took mere minutes and not a single extra email conversation to be validated. The winning SSL Vendor took the approach that if I’m in control of my domain, I should also be in control of a few standard domain email addresses. A verification was sent to one of those email addresses. I responded to it. Done. And I didn’t even go through the parent company – I went through a reseller, and the process was still flawless (and cheaper). Rule #1 in this girl’s Guide to the Internet is: Never post your home address. Whether you are a 14-year-old in a chat room or a 30-something girl geek registering a domain, it makes sense to keep that information private. In keeping with that rule, I use my work address when registering my own domains. Other people I know use post office boxes. I do not consider such a thing as bizarre or unexpected behaviour. As long as I can receive postal mail at the specified address, I do believe that I have satisfied the original registration requirement. details to match with whois. which you can provide the documents. As it is highly unlikely that I will be able to produce a copy of an “official” document containing my work address, the only alternative that the SSL company is willing to entertain is for me to update my WHOIS information with my home address, so that it matches my drivers license. I consider that unacceptable, and I think it is a perfect example of users being railroaded into placing more information than they want into the public domain. Yes, I could temporarily change my information to my home address to get the cert and change it back. Yes, I could probably get my company to request the certificate, because we’re a small company and because I have a nice boss. That isn’t the point. The point is that most people will do what the vendor asks, because they are being held hostage. They want SSL. They are told they have no other options. It is easier to accomodate under duress, than to stand up and say no. I think that there are other options. The goal shouldn’t be to prove where I live, but to prove that I have control over the domain. I could, for example, change my WHOIS data to say “SSL VENDOR X SUX”. Besides making me feel better, I think it would prove some measure of control over my domain, but just in case, I could set it to a mutually agreed upon string. That would be a lot tougher to spoof than oh, say a photoshopped drivers license, yes? Ideally, wouldn’t it be great if the SSL company could receive an assertion from the company I registered my domain with, attesting to the fact that I own the domain? I’d like to see that happen. Until then, SSL Vendor X can stuff it, and I will try and find a vendor who will take my money and treat information I wish not to disclose with a little more respect. Wish me luck.